Rabbi Dr Deborah Kahn-Harris was raised in Houston, Texas and received a BA in Art History from Mount Holyoke College in Massachusetts. She came to the UK in 1989 to study at the Oxford Centre for Postgraduate Hebrew Studies, before entering the semicha programme at Leo Baeck College. Ordained in 1996, she subsequently worked for the Reform Synagogues of Great Britain (RSGB, now MRJ) initially as a university chaplain, building up student and young adult work until a new department was formed around her work. 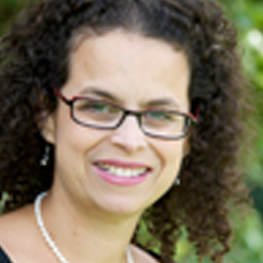 Rabbi Dr Deborah Kahn-Harris was appointed Director of Student and Young Adult Work, sitting on the Senior Management Team of the RSGB. In 2001 she departed to live in Jerusalem for a year, where she taught in several places, including on Machon and Ta Shma. After a brief stint at as temporary assistant rabbi at Temple Beth Israel in Melbourne, Australia, she returned to the UK where her working time was divided between serving on the rabbinic team at Sha’arei Tsedek North London Reform (previously Southgate and District Reform Synagogue), teaching at Leo Baeck College, working on a PhD in Bible at the University of Sheffield and teaching Bible and Jewish Studies at SOAS in 2007-09. From 2009-2010 Rabbi Deborah Kahn Harris was co-vice chair of the Assembly of Reform Rabbis UK. She also co-hosted an intra-Jewish dialogue project with her husband, Dr Keith Kahn-Harris. Her PhD is entitled ‘A Hammer for Shattering Rock: Employing Classical Rabbinic Hermeneutics to Fashion Contemporary Feminist Commentary on the Bible’ which was completed during summer 2011. Rabbi Deborah Kahn-Harris is currently Principal of Leo Baeck College, where she also teaches Bible.